The first John Foxx box set, the enigmatically titled Cinemascope, was released in December 2008, limited to just 1000 copies. 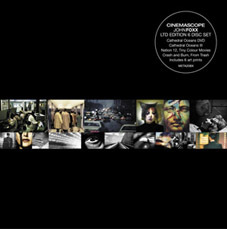 Cinemascope features six original albums - Crash and Burn (2003), Cathedral Oceans III (2005), Tiny Colour Movies (2006), From Trash (2006), the Nation 12 album Electrofear (2005) as well as the Cathedral Oceans DVD (featuring the music of Cathedral Oceans III). The albums were re-packaged in wallets, featuring alternative artwork to the original pressings. Cinemascope also contains six small art prints of John Foxx's artwork.